Just aim & shoot to get an instant digital readout. 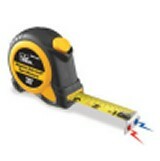 Measure with 99% accuracy up to 50 feet. Carry it in your pocket or briefcase, in the office or out in the field.